She's Fantastic: DC Comics Icons - HARLEY QUINN! DC Comics Icons - HARLEY QUINN! Sometimes I forget how much Harley Quinn has evolved from her first appearances. When she first made the leap into the "real" comics world (ie, not BTAS spin-offs) I was just not a fan. She was kind of dark and grim, and I thought her humor was more sadistic as opposed to her quirky irreverence we all love today. 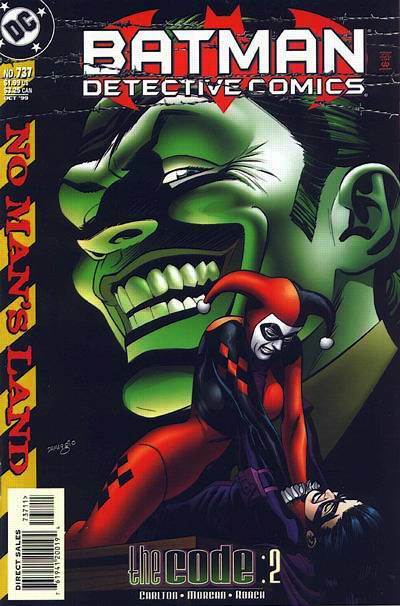 Her first big non-animated story arc was 1999's No Man's Land, which is the basis for this specific Harley figure. It wasn't until December of 2000 that the first Harley Quinn solo series started. I feel like that series is where we started to see the the modern Harley start to evolve, but this figure is the precursor to all that. The Icons series is meant to be an unofficial continuation of Mattel's DC Universe Classics. They are a smaller scale than previous DC Collectibles figures and have a completely different body style. The really are like really high quality cousin of DCUC and it makes me super excited for the Burnside Batgirl in November. Let's check out No Man's Land Harley below! The sculpt by Paul Harding is pretty great. I don't think we've seen any DC ladies from him since those 3.75" Injustice figures and the Arkham Asylum Poison Ivy from 2011. He really captured that early Harley look. Harley comes with a few extra hands, a mallet, and a cork gun. These figures are very nicely articulated. Here she is with the DCUC Series 02 Harley Quinn from 2008. And with two recent DC Collectibles Harley to show scale: BTAS Harley and Arkham Knight Harley. Nice review! Mine is sitting in my Pile of Loot at BBTS and I'm waiting for a few more things to show up before I ship. She looks incredible! I'm being pretty selective with this line (only Batman characters) but so far it seems amazing. She's pretty great. My only fear is that they'll re-release her with an alternate head that I like better. Did you see the new balent Catwoman from SDCC? She's going to be great. I'm really contemplating this one. With the amount of preorders I have on BBTS, this one seems to just have to sit out. But considering I'm getting two Robbie Margot Harley Quinn next year(Mafex and Premium 6 inch), I should at least pick up a classic Harley. Pay homage to her roots that a lot of 'movie comic book goers' will probably NEVER know about. That classic homage angle is exactly why I like this figure. She represents that middle ground between the animated versions and the quirky weirdo we see today. There are so many high end SS Harleys that I'm really going to have to limit myself. But like you I will probably get the DCC and Mafex ones. I'm debating on whether I should get this one or the DC Universe Classics one. I think I might get this one because of the amount of detail and accuracy. I love Harley so much! I think this one is far superior to the DCUC one. The construction is much more solid and the proportions are more balanced. Plus even though I don't LOVE either face sculpt, the DCC one looks way better in comparison.